Is Your Entrepreneurial Ecosystem Scaling? Since retiring from Washington University in late 2014, I have reflected on the 15-year evolution of the St. Louis entrepreneurial ecosystem. While at Washington University, I watched the St. Louis region move its ecosystem from a nascent dream to what is now mid-stage maturity. This journey was possible because of a mixture of top-down strategy (economic development), wealth-seeking initiatives (venture development), and bottom-up efforts (entrepreneur development). This mixture created an environment of collaboration and cooperation (and sometimes conflict) that resulted in a high level of momentum that is now sustaining itself as it expands. The purpose of this essay is to explain and examine (1) what really happened, (2) whether the momentum created in the St. Louis ecosystem will continue, and (3) what other regions can learn from our experiences. In reflecting on these experiences, I have developed the entrepreneurial ecosystem framework that I share here, in three parts. The first part of the framework describes an ecosystem inventory, which is designed to support an assessment of a regional entrepreneurial ecosystem. The inventory functions by establishing a baseline that inventories the ecosystem’s parts and relating them to one another. This baseline can then be used to measure momentum and growth as an ecosystem evolves. The second component of the framework discusses different approaches to measuring entrepreneurial ecosystems. Measurement in this context concentrates on three areas of assessment: (1) economic outcomes, (2) cultural and social factors, and (3) ranking methodologies. It selects one approach to cultural and social factors that is particularly good for measuring the momentum of a regional entrepreneurial ecosystem. In the final part of the paper, I apply the inventory and describe our experiences using the selected measurement approach in St. Louis. This explains the relevance of the framework in practice, and how the St. Louis ecosystem evolved. These thoughts are intended for municipalities, universities, innovation districts, research parks, individuals, community leaders, and governments that are developing or growing entrepreneurial ecosystems to improve society. In St. Louis, the players inside and outside of our ecosystem (support organizations, aspiring entrepreneurs, active entrepreneurs, investors, universities, governments, business people, chambers of commerce, economic development professionals, service providers, and others) frequently commented that it was hard to identify all the entrepreneurial activity. Some said we needed to do a better job communicating the high level of entrepreneurial energy so that public and philanthropic supporters could better understand what was happening and whom to fund. Others felt there was unrealized potential to attract more entrepreneurs and funders. We worked on several ways to accomplish this, including websites, publications, social maps, and year-end reports. All of them helped, but something was still lacking, and we needed a better way to catalog and measure our progress. Many people are involved in creating an entrepreneurial ecosystem, and it is critical that they have a common language to describe the components of a regional system to help them understand one other. This in turn helps to create connections between players who have common interests, which results in deeper collaboration and higher-velocity relationships. When we began in St. Louis, many pockets of entrepreneurial energy and activity were dormant or disconnected because the people involved did not know about one another. The websites, publications, social maps, and reports we developed helped, but an inventory approach with more defined measurements would have been extremely useful. This essay provides such a framework. Figure 1 shows the ecosystem inventory framework. It is a generic map that presents 12 intersecting sectors that are based on the stage of activity (from left to right across the top of the matrix) and the type of development (from top to bottom). The stages of activity include (1) discovery, (2) idea, (3) startup, and (4) growth, while the types of development represent the various undertakings related to the (1) entrepreneur, (2) venture, and (3) economic development. The inventory allows a region to position its ecosystem players and show them their roles relative to others. It also makes it easier for aspiring entrepreneurs to find programs and activities that match their stage of development. This increases the number of participants and creates new relationships and collaboration that catalyze ecosystem momentum. The three types of development in the inventory are linked to specific ecosystem actors, and to the type of activity within the entrepreneurial ecosystem. The first is entrepreneur development, which focuses primarily on activities that support the individual contemplating taking action on an idea. The activities that support these prospective entrepreneurs are typically offered free or for a nominal fee. No equity or compensation is exchanged, and the legal structure is normally a not-for-profit model. University education and co-curricular programs can play a large role in this part of the ecosystem. As seen in Figure 2, entrepreneur development includes idea exchange sessions, mentoring services, grant funding, competitions, internships, education events, speaker events, startup weekends, hackathons, and other similar activities. The second type of ecosystem development is venture development, whose primary role is to create successful companies and wealth. Support is given to ventures that have shown enough promise to warrant funding, and service providers are compensated with equity or cash. Investors want winners, thus the funding selection process is competitive, the goal being to pick not just good deals but the best deals. Entrepreneurs and investors are required to share wealth, and the legal structures they establish support wealth-seeking and wealth-sharing. As seen in Figure 2, this type of development includes self-funding, friends and family, service provider discounts, angel investors, accelerators, venture capital funds, government co-investment funds, strategic partners, and private equity. Venture-focused technology transfer and corporate innovation initiatives fall into this part of the ecosystem. Economic development is the third type within the inventory. The primary focus here is on putting into place the assets and infrastructure needed to cultivate, support, and mature ventures. Economic development is often rooted in public policy and is supported by top-down strategies that often are led by government economic development agencies. In St. Louis, for example, strong leadership in the city and county government organized creative public, private, and philanthropic partnerships to support economic development. These partnerships developed strategies, generated incentives, and made considerable investments in facilities, scientific research initiatives, digital networks, capital formation, workforce development, and similar areas, all of which are key for the ecosystem. Figure 2 maps common activities within the three types of development as examples of what occurs within an ecosystem. 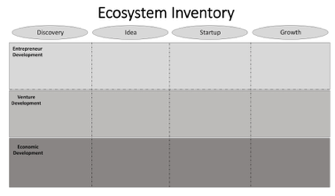 The stages of ecosystem activity in the inventory have four phases: (1) discovery, (2) idea, (3) startup, and (4) growth. The discovery stage is described as scientific research that may lead to a startup idea or invention, and it is often supported by government, philanthropy, or public-funded research. An example of research funded by philanthropy in St. Louis is the Donald Danforth Plant Science Center, a not-for-profit scientific research facility founded in 1998. Its mission is to “improve the human condition through plant science.”1 The center has more than 200 employees, including 19 principle investigators in a number of scientific specialties. A second example is publicly funded research at universities such as Washington University, St. Louis University, and others, which collectively receive about $700 million annually in public funds for research.2 In the entrepreneur development sector, proof of concept funds and events such as hackathons are examples that happen during the discovery stage. The second stage of activity is the idea stage, where a potential entrepreneur has identified a problem or opportunity but has not yet acted on their idea. 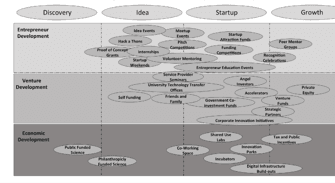 As shown in Figure 2, entrepreneur development has a large number of idea-stage support activities, which are critical to creating a high-momentum entrepreneurial ecosystem. A large amount of entrepreneurial potential will remain dormant if there is no entrepreneur development support to invite action. The startup stage is the third distinguishable activity within the entrepreneurial ecosystem. At this stage, prospective entrepreneurs commit to founding a venture, allocate time and resources to pursue it, and make a significant effort to refine their ideas. Activities occurring during the startup stage include selecting a legal entity and structure; developing a proof of concept; implementing intellectual property strategies; testing and market validation; team formation; developing financial plans and fundraising strategies; and similar activities related to launching a venture. Entrepreneurs also begin to connect to venture funding sources. The vibrancy of the startup phase depends on the number of entrepreneurs who become active after they graduate from the idea stage. The growth stage is the final one in the ecosystem inventory. It is the stage when the market, customers, and investors validate a company and includes activities such as market launch, revenue generation, positive cash flow, competing, additional funding, scaling, and exit. Economic development measurements, the most common and mature of the three measurement approaches, track economic inputs and quantify economic outcomes. The U.S. Economic Development Administration (EDA) recommends starting with a top-down strategic planning effort to engage the community.4 This includes understanding a region’s competitive advantages, selecting regional clusters, calculating innovation capacity, and identifying and supporting venture development organizations (VDOs). The EDA also suggests identifying levels of distress; developing a strategic plan; building the regional ecosystem and identifying competitive advantages; deciding among competing projects; and following best practices in incubator management. In St. Louis, the first step we took in our activities in the 2000 timeframe used this type of approach. The Regional Innovation Acceleration Network (RIAN) is another approach to economic development measurement.5 RIAN uses four economic outcomes to measure success, including (1) jobs created, (2) wages paid, (3) investments attracted, and (4) revenues earned. They also recommend benchmarking that allows a comparison of different regions so they can assess outcomes and identify best practices to share. Like the EDA, RIAN recommends starting venture development organizations (VDOs) to produce successful ventures as a way to achieve their four economic outcomes. As their name implies, VDOs fall within the venture development sections on the ecosystem inventory. They select ventures with greater potential and support them with mentoring, entrepreneurs-in-residence (EIRs), financial assistance, facilities, and other activities. Nearly all economic development and ranking measurements recognize the importance of the cultural and social factors that impact entrepreneurial ecosystems.7 This section describes one of the most promising approaches to cultural and social measurement, and in section three it pairs it with the ecosystem inventory concept discussed in section one. The Stangler/Bell-Masterson factors are especially useful in measuring the momentum of regional ecosystems when used with the ecosystem inventory. Measuring momentum is key, because ecosystem development takes a long time and it is important to ensure that the momentum is continuous and vibrant and does not stall. Ranking methodologies use a number of metrics to compare larger cities or countries across several economic, cultural, and social factors, including surveys and economic datasets that assess entrepreneurial activity and environments. These approaches compare the strengths and weaknesses of ranked entities, usually cities or countries. Over time the measures show how a city or country moves up or down in the rankings. The ranking methodologies use various indicators and surveys, which are described in the examples that follow. One commonly cited ranking is the Kauffman Metropolitan Index of Startup Activity, which is completed annually.10 It compares three factors for 40 U.S. cities: (1) the percentage of the adult population that become entrepreneurs in a given month; (2) the percentage of entrepreneurs who were not employed before starting their venture; and (3) the number of startup firms per 100,000 adult population. These calculations are drawn from the U.S. Census Business Dynamics Statistics and the U.S. Bureau of Economic Analysis. The Global Entrepreneurship and Development Institute (GEDI) offers an approach that uses the Global Entrepreneurship Index (GEI), which is a framework that compares a mixture of economic, institutional, cultural, and social factors in 132 countries.13 The 14 GEDI factors are grouped into three categories: (1) entrepreneurial attitudes, (2) entrepreneurial abilities, and (3) entrepreneurial aspirations.14 The GEDI methodology provides insights for policy changes that can support entrepreneurship. For example, in 2015 the GEI recommended that policymakers in Europe “help entrepreneurs perceive entrepreneurship opportunities,” while sub-Saharan Africa was advised in the same year to focus efforts on “supporting post-secondary education.”15 The GEI makes similar recommendations for each country. A fourth ranking methodology is the European Digital City Index, which compares 35 European cities using ten economic development, cultural, and social measures:16 (1) level of access to capital, (2) business environment, (3) digital infrastructure, (4) skills, (5) entrepreneurial culture, (6) knowledge spillovers, (7) lifestyle, (8) market, (9) monitoring and managerial assistance, and (10) nondigital infrastructure. Like the GEDI measurements, it provides insights for policy decisions and economic development investments. In general, the rankings methodologies tell us something about the state of entrepreneurship within a given city or country. However, many cities are not ranked, especially small and medium-size municipalities. Moreover, because ecosystems are at widely different stages of maturity, the comparisons may not be instructional or actionable. For example, what works in Silicon Valley might not be appropriate for St. Louis. Ranking measurements cite the importance of cultural and social factors but do not suggest how a region’s specific ecosystem can improve these critical variables. Stangler and Bell-Masterson offer an approach that can be used to measure social and cultural momentum. In the next section I offer my observations on how St. Louis started and then scaled its entrepreneurial ecosystem to a mid-stage of maturity. Using the ecosystem inventory approach and Stangler/Bell-Masterson measures, I delve into how a city can spur a level of momentum that will help to create a vibrant entrepreneurial culture and produce strong economic outcomes. Developing a vibrant ecosystem takes a long time, a lot of collaboration, and some luck. Because of my affiliation with Washington University and the Kauffman Foundation, I was one of many people who supported the entrepreneurial evolution in St. Louis. In this section I describe the three periods of change St. Louis experienced from 2000 to 2016: (1) the early years, (2) the period when the city gained momentum, and (3) how the ecosystem began to scale. I emphasize the important relationship between entrepreneur development, venture development, and economic development, and show how all are needed to produce healthy economic outcomes. I use Stangler/Bell-Masterson’s measurements to retrospectively measure and explain the city’s evolution. The effort in St. Louis began in the late 1990s, following a strategic review of an economic development cluster analysis. The result of this top-down effort, which included government, philanthropists, universities, industry leaders, and the community, was a decision to create a plant and life sciences cluster. By 2005 St. Louis had in place three venture funds focused on life science, two of the nation’s top-ten life science incubators, a new plant science research facility supported by philanthropy, a new angel investor group, workforce development initiatives between community colleges and industry, and other assets. The expected economic outcomes were new companies, jobs, investments, company growth, exits, and new wealth. However, we were not getting the desired economic outcomes, and local individuals and outside observers told us that we lacked an entrepreneurial culture. One common joke made by entrepreneurs was that “St. Louis is a place where investors have deep pockets but short arms.” We began to ask ourselves why we were not getting strong economic returns. The region had invested heavily, so where were the financial payoff and cultural momentum? What was missing? Company founders complained that they had to leave town to get funding, while investors grumbled that the deals available were not worth putting money into. It is helpful to use the Stangler/Bell-Masterson measures retrospectively to explain what was happening. For one thing, the new firms had little density and a low employment share, and few areas showed economic vibrancy. We also lacked entrepreneur founders and managers and were losing young people and university graduates to other areas. Our new venture funds were investing, but many of their deals were outside St. Louis. Although connectivity was gaining momentum, particularly a new volunteer mentoring service and programs at Washington University, a lot of entrepreneurs had never connected with one another and many were not in the strategic focus area. Plant and life sciences were receiving the bulk of economic development resources, thus we lacked diversity within the ecosystem, and many felt they needed to be in plant and life sciences to receive any support. Figure 3 uses the Stangler/Bell-Masterson measures to summarize where we were. At this point our fledgling ecosystem did not yet have the human and cultural capacity to deliver economic returns from our economic development investments. For one thing, we lacked entrepreneurs, a sign that our community’s collective entrepreneurial IQ was low. The Skandalaris Center had a fourfold role in the ecosystem: (1) on campus, connect stakeholders interested in entrepreneurship (students, faculty, alumni, administrators); (2) provide a welcoming doorway between university and community entrepreneurs and investors; (3) support all types of entrepreneurial interests, including technology, plant and life sciences, art, design, law, social entrepreneurship, and any other areas that students or faculty brought forward; and (4) use curricular and co-curricular activities to create an inviting starting point for aspiring student and community entrepreneurs who had ideas but had not taken action. Especially active was the idea stage of entrepreneur development. We found that lots of aspiring entrepreneurs were not engaged or taking action. The trick was how to get them involved while maintaining an affordable resource model. We could not mentor everyone who came forward with an idea, so we designed high-energy, low-cost events where a lot of new relationships could be formed. People did in fact mentor and team up with one another without our being in direct control. This approach caught on, and a number of programs in the entrepreneur development sector adopted it. The Skandalaris Center created co-curricular programs with no academic credit to connect students with the community. This included a subsidized undergraduate entrepreneurial summer internship program in which 25 students spent ten weeks working for young companies in the early startup phase.19 Another was IdeaBounce, which connected students and community entrepreneurs in the idea stage with advisors.20 We collaborated with community partners to offer nearly $300,000 in annual funding for business formation competitions that supported commercial and social entrepreneurs.21 The competitions were open to students and the community to spur connectivity and learning. The key to these programs and others was that we intentionally designed them to create a massive number of new relationships. At a typical IdeaBounce event some 40,000 “second-degree” connections could occur—to use Stangler/Bell-Masterson’s language, connectivity was increasing at warp speed. Hundreds of people were learning from each other as they formed new relationships and collaborated, and our community’s entrepreneurial IQ was rising quickly. Helping prospective entrepreneurs and advisors meet each other gave us more entrepreneurial action at low cost. People also teamed up to create new entrepreneurial interest areas, and the diversity of ideas was growing because of new bottom-up efforts led by people who championed their ideas. No single group was teaching but we all were learning. Most of the St. Louis ecosystem entrepreneur development programs were bottom-up, founded and led by their champions, marginally funded, collaborative, and autonomous. The efforts were affordable because they had to find their own funding to prove their value. One was Innovate St. Louis, a not-for-profit that offered volunteer mentoring.22 Innovate and the Skandalaris Center collaborated and, with help from the Kauffman Foundation, replicated the MIT Venture Mentoring Service in St. Louis.23 This program, which was philanthropically funded and started with a low budget, served all entrepreneurs in the region and spurred connectivity and diversity, further accelerating our community’s entrepreneurial IQ. Innovate St. Louis was also important because it offered a good lesson in how to scale the ecosystem, which was first to collaborate and form new entities, and then have those entities become autonomous and self-governed. We saw that the ecosystem scaled much more quickly when we did this than if we tried to control things centrally. The trick was to keep the resource model affordable. ITEN, another key player, appeared in 2008, starting as a specialized program within Innovate St. Louis that mentored tech entrepreneurs.24 It eventually became so successful that it spun out as an autonomous not-for-profit legal entity with its own funding and leadership. No single entity was coordinating the bottom-up entrepreneur development, and we were once again scaling by supporting champions who created new pockets of energy and interest. These efforts were increasing connectivity and diversity in a big way. Stangler/Bell-Masterson’s measurement language would have helped us understand how the non-economic areas of the ecosystem were evolving and how critical the social and cultural elements were to economic outcomes. Between 2009 and 2012 we achieved critical momentum across the three ecosystem inventory areas. We continued to make top-down economic development investments, but the resource model was gradually shifting as part of the investments were being privately funding. Venture development and capital were increasing, and bottom-up entrepreneur development programs were increasing on many fronts as more champions naturally appeared. We began to worry that there was not enough capital to support the many new young ventures. Another concern was that all the entrepreneur development programs (mostly new not-for-profits) were approaching the same funders, who were getting overtaxed and strained. We began to disagree on whether to focus on supporting what we had or to continue to grow by starting new initiatives. Some people felt we should slow down, plan, rationalize, and eliminate duplication (top-down). Others wanted to start more fires and let the market decide what survived (bottom-up). So what happened? We continued to do both while we completed another regional plan. Figure 4 shows where we were during that period. In early 2013, the St. Louis Regional Entrepreneur Initiative Report was completed by the St. Louis Economic Development Partnership.25 It and other information provide a good summary of where we were at that time. Bottom-up entrepreneur development initiatives grew and new champions started more programs. Bio Generator expanded its EIR program and created the Bio Generator shared-use Labs.29 ITEN created an EIR program.30 Arch Grants, a new not-for-profit, began offering $1 million annually to 20 companies (about $50,000 each) if they would move to or were already in St. Louis.31 The Skandalaris Center provided funding so Washington University entrepreneurs could apply for Pipeline Entrepreneurs, a growth-stage entrepreneur development program for high potential entrepreneurs in the Midwest.32 The Missouri Technology Corporation created the Missouri Building Entrepreneurial Capacity Program, which offered matching grants for entrepreneur development initiatives.33 Kauffman’s One Million Cups weekly entrepreneur meet-up came to St. Louis and its champions partnered with the local PBS station to record and stream the sessions.34 The PhD and postdoctoral students at Washington University created the Bio Entrepreneurship Core, a student club with 400-plus members that was initially funded by the Skandalaris Center.35 The Bio Entrepreneurship Development (now Square) program was created for idea-stage life science entrepreneurs and out-placed Pfizer scientists and executives who wanted to investigate entrepreneurship as a career.36 The Skandalaris Center received a National Science Foundation Partners for Innovation Grant, which concentrated on life science entrepreneur development that focused on university commercialization by establishing fellowships supported with a 25-person volunteer mentor pool.37 There was a great deal of collaboration, knowledge-sharing, and engagement through these efforts that contributed to the ecosystem’s momentum. Top-down investments and planning continued. This included more support from state and local governments and community leaders, the expansion of incubators and research facilities, and the creation of TREX, our first co-working space.38 More building occurred at Cortex. The Helix Center, BRDG Park, and the Donald Danforth Center expanded.39 TREX deserves comment because it was a bottom-up bootstrap effort made possible because the tech-sector density had become large enough to warrant its own facility. Momentum in St. Louis increased even more from 2013 to 2016, and we reached a mid-stage of ecosystem maturity. In Stangler/Bell-Masterson’s language, we gained momentum across all four measures, our community’s entrepreneurial IQ is higher and continues to grow, and deals are getting better and easier to make. We’re achieving solid economic outcomes, as shown in Figure 5. The number and size of entrepreneurial co-working spaces have exploded. TREX moved to a new location in the downtown area. It now houses over 150 companies, four accelerators, and Cultivation Capital. The Cambridge Innovation Center (CIC), Boston’s massive co-working operation, chose St. Louis as its first expansion city.40 CIC St. Louis grew rapidly and filled to capacity. It took over management of the Center for Emerging Technology, one of our earlier life science incubators, remodeled the co-working space, and is now near capacity.41 CIC and Cortex host 160 ventures. Twelve champion-led neighborhood or interest-specific co-working spaces opened around the city and in the suburbs. Each has 10 to 50 companies that offer entrepreneur development programming to fit their geography and interests. Universities continue to increase their involvement in the ecosystem. Washington University made entrepreneurship and innovation a strategic pillar for the institution and it is substantially increasing its resource commitments and engagement. St. Louis University continued its involvement on several fronts. The University of Missouri in Columbia made a larger commitment to entrepreneurship and connected to the St. Louis ecosystem. Other St. Louis universities, including St. Louis University, the University of Missouri in St. Louis, Webster, Maryville, Harris Stowe, Lindenwood, and others expanded their entrepreneurship activities and curriculum. Entrepreneur development continues to expand and diversify. Venture Café, the not-for-profit entrepreneur development arm of CIC, began operations in late 2014 and quickly became a new place for connectivity.42 Venture Café’s weekly events routinely host up to 500 participants, around one-third of whom are first timers investigating whether they should enter the ecosystem. Much of the Venture Café programming focuses on entrepreneur development topics across a broad spectrum of interests and venture types. Using the autonomous, champion-led model, two new not-for-profits were created by Washington University graduate students with support from the Skandalaris Center. These self-funded entities increased momentum and added enormously to the ecosystem’s relationship velocity and entrepreneurial IQ. Both are now located in CIC’s co-working space. The BALSA Group is a consulting firm created by Washington University doctoral and postdoctoral students in late 2011 to help early stage life science startups.45 The students, who wanted to learn about entrepreneurship and business, now include 200 unpaid consultants who have completed 128 projects. The BALSA Group established the BALSA Foundation in 2015 to provide funding grants and mentoring to idea-stage startups, especially those led by less advantaged entrepreneurs. Idea Labs was started by MD and PhD students at Washington University in 2013. Since then they have worked on more than 200 ideas provided by clinicians and engaged 233 graduate and undergraduate students on 39 teams:46 79 percent of the teams completed proof of concept prototypes, of which 15 (48%) protected their intellectual property; 17 (54%) are commercializing their technology; and 16 (52%) won awards or funding totaling approximately $2 million. They have worked with more than 60 physicians, 15 engineering advisors, and 15 mentors from the community. Idea Labs is expanding to other cities (Philadelphia, Boston, Minneapolis), where it is collaborating with likeminded university students. Connectivity and fluidity increased on new fronts. Ventures started to move to St. Louis from other areas. A number of corporations and service providers rented space in entrepreneurial co-working facilities because they liked the feel and thought it was culturally important for their innovation goals. An increasing number of large and entrepreneurial companies selected St. Louis for their headquarters or expanding operations. Economic development investments continued with greater private investment support. Five new accelerators were formed, each attracting 10 to 15 companies annually. Their areas of interest include financial services, ag-tech, women entrepreneurs, and sports-related ventures.51 All are champion-led and self-funded. Cortex, TREX, the Donald Danforth Plant Sciences Center, and BRDG Park expanded. More capital appeared than expected. The Bio Generator portfolio nearly doubled to 65 companies. Established venture funds raised next-generation funds. Investments from outside the region increased. Successful exits resulted in more capital, talent, and investment groups. St. Louis became nationally recognized as a high-momentum region for innovation and entrepreneurship. What’s Next for the St. Louis’ Ecosystem? My intuition is that there is enough momentum for the St. Louis ecosystem to become financially and culturally self-sustaining within ten years. To reach this point, the city will need more exits to produce the new money and talent that will allow the ecosystem to become fully market funded versus being publicly subsidized. In the end, successful ecosystems only scale when they become self-supporting, and entrepreneurship becomes a recognized and material portion of the region’s economy. Some predict we may be experiencing a nationwide entrepreneur bubble and that all regions, including St. Louis, will face retrenchment or worse if valuations fall and financing dries up. We will all have to wait to find out but I am optimistic and feel entrepreneurial momentum may carry the day. Silicon Valley is an illustration of what can happen when a region’s momentum reaches critical mass and becomes self-sustaining. How much potential is there for St. Louis or other cities? The Silicon Valley ecosystem is about 65 years old; St. Louis is 15 or so. Money Tree reports that Silicon Valley produced 616 venture-funded deals in the second half of 2015, while the entire Midwest had 192 venture-funded deals for the same period.61 That gives us lots of room to expand. Even if momentum and entrepreneurial IQ grow at 50 percent a year, it will take St. Louis a long time to reach the scale of Silicon Valley. I think St. Louis would be happy with 50% increase annually in momentum and growth. Stangler/Bell-Masterson’s measures and the ecosystem inventory framework can help us measure our momentum and track how we are doing. The key will be to keep the momentum increasing each year. How Might Other Region’s Use this Framework and Measurement Approach? Regions should measure their innovation momentum annually. Step one is to complete an ecosystem inventory as a base line documenting the current state of innovation and entrepreneurial activity in the region. This should be done for each of the region’s industry areas. For example, in St. Louis, this would be for Life Sciences, Tech, Agtech, Fintech, Women Entrepreneurs, Social and the different innovation areas that are evolving. Step two is to identify the data and information sources that are needed to measure the region’s density, fluidity, connectivity, and diversity each year. This is becoming easier as more and more sources are evolving from Internet-based calendars and datasets. Step three is to convene annual discussions about how and where resources should be used to increase innovation momentum for the region.